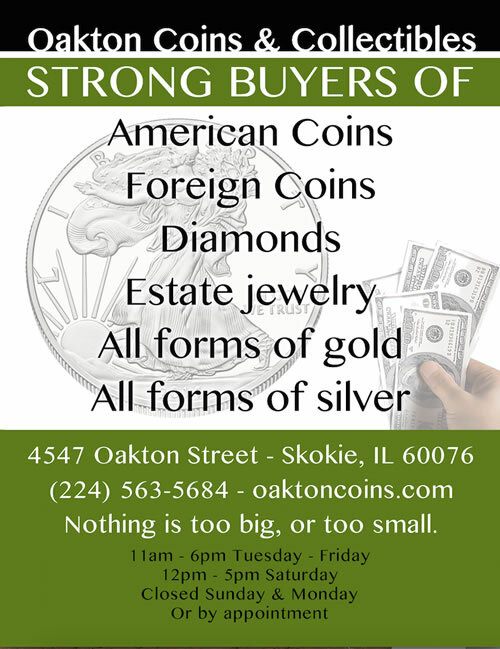 Oakton Coins & Collectibles buys all forms of silver. Its always smart to shop around when selling your old silver jewelry especially in the Evanston – Skokie area. Many times the 12 minute trip to Skokie to sell your silver is well worth your time (much lower overhead than downtown Evanston silver buying shops). Give us a call 224.563. 5684. BUT….. understand it does not matter what a jewelry store charged you for your everyday non luxury brand silver. Silver price is based on weight (currently around $17 an ounce) so you need a lot of it to get a lot of money (just fyi). Sell your unwanted silver, diamonds, silver and platinum at highest prices!!! Household silver or SILVERWARE (the silver, the plate) includes tableware, cutlery and other household items made of sterling silver, Britannia silver or Sheffield plate silver. Silver is sometimes bought in sets or combined to form sets, such as a set of silver candlesticks or a silver tea set. Silver requires a good deal of care, as it tarnishes and must be hand polished, since careless or machine polishing ruins the patina and can completely erode the silver layer in Sheffield plate. Fine silver, for example 99.9% pure silver, is generally too soft for producing functional objects; therefore, the silver is usually alloyed with copper to give it strength while preserving the ductility and beauty of the precious metal. Other metals can replace the copper, usually with the intention of improving various properties of the basic sterling alloy such as reducing casting porosity, eliminating firescale, and increasing resistance to tarnish. These replacement metals include germanium, zinc and platinum, as well as a variety of other additives, including silicon and boron. Alloys such as Argentium sterling silver have appeared in recent decades. Silver is produced during certain types of supernova explosions by nucleosynthesis from lighter elements through the r-process, a form of nuclear fusion that produces many elements heavier than iron, of which silver is one. 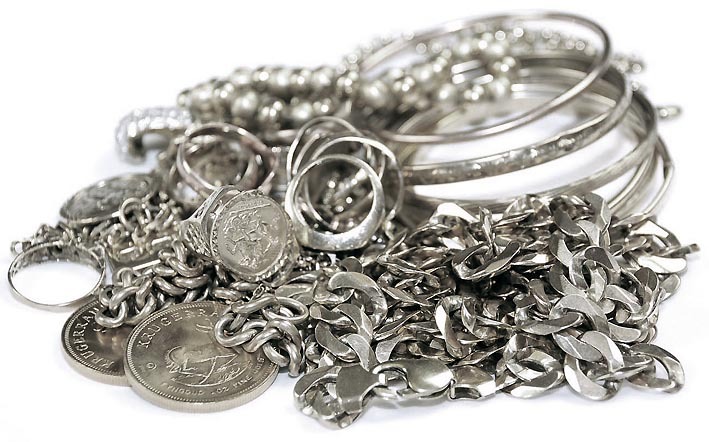 Silver is a very ductile, malleable (slightly less so than gold), univalent coinage metal, with a brilliant white metallic luster that can take a high degree of polish. Protected silver has higher optical reflectivity than aluminium at all wavelengths longer than ~450 nm. At wavelengths shorter than 450 nm, silver’s reflectivity is inferior to that of aluminium and drops to zero near 310 nm. The electrical conductivity of silver is the highest of all metals, even higher than copper, but it is not widely used for electrical purposes due to its much higher cost. An exception to this is in radio-frequency engineering, particularly at VHF and higher frequencies, where silver plating is employed to improve electrical conductivity of parts and wires (at high frequencies current tends to flow on the surface of conductors, not their interior, hence silver plating greatly improves overall conductivity). Silver also has the lowest contact resistance of any metal. During World War II in the US, 13,540 tons were used in the electromagnets used for enriching uranium, mainly because of the wartime shortage of copper. Pure silver has the highest thermal conductivity of any metal, although those of the nonmetal carbon in the form of diamond and Superfluid helium-4 are higher. Silver halides are photosensitive and are remarkable for their ability to record a latent image that can later be developed chemically. Silver is stable in pure air and water, but tarnishes when it is exposed to air or water containing ozone or hydrogen sulfide, the latter forming a black layer of silver sulfide, which can be cleaned off with dilute hydrochloric acid. The most common oxidation state of silver is +1 (for example, silver nitrate, AgNO3); the less common +2 compounds (for example, silver fluoride, AgF2), and the even less common +3 (for example, potassium tetrafluoroargentate(III), KAgF4) and even +4 compounds (for example, potassium hexafluoroargentate(IV), K2AgF6) are also known.